Thanks again to everyone who visits, and for your comments - I love to hear what you think of my work. To all the SSS peeps, I try my best to come by all your blogs, but I apologize if I cannot make it to each of the 150+ participants. I definitely visit if you comment on here though. Once again, big big thanks! 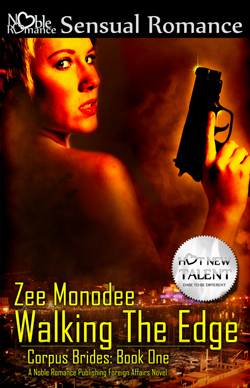 So, I'm still plugging my June 29 release Walking The Edge (Corpus Brides: Book One) from Noble Romance Publishing. Quick recap - Amelia, my heroine, has amnesia. The man who says he is her husband plies her with drugs and monitors her every move...until the day Amelia manages to ditch her bodyguard and she heads to Marseille, to find a man she saw in her drug-induced dreams. But once in the French city, things don't go as planned because Gerard, the man in question, does not recognize her. He thinks she's a trap sent to lure him, and he's out to get her. In last week's excerpt, he had cornered her in a side alley after a pretty rough struggle, and we left them with his gun aimed at her. What will Amelia do now? '... She saw murder on his features. Even in the dim surroundings, there was no mistaking the coiled tension in him. She let her body relax, the pressure from his lower body pinning her even more as she sagged against the wall. "You're hurting me," she said. A part of her was aghast that she had a gun pointed at her, yet another part was already spinning how she could extricate herself from her situation. More SSS goodies here! Have a lovely Sunday! The energy in this snippet punches out at you. Great 6. Great action - first line was a definite attention getter to keep reading on. Love that she keeps a cool head in the face of such danger. Go girl! Oh geez it's getting nail biting. Great six! That's good stuff. Great six! Great, intense snippet, and I love the premise of this story! "...murder in his features". Love it! Tense, exciting six! I love how we can see the wheels turning in her mind. I bet he can too! How can she relax in such an intense situation? Very telling part of her characterization. Well done as always, Zee! Great post. And great job portraying her calm in the face of a dangerous situation. Oooh!!! This is exciting! I want to see more!